We used our Texture Magic on the cuff of some of our samples. It makes the stockings really special, but it's not necessary to complete them. Click the Related Products tab above to purchase our Texture Magic. We've included 2 different files to use with the Texture Magic. The stockings are included with stipple quilting on the fronts and with plain fronts. 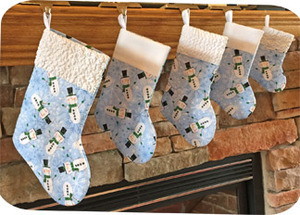 Our stocking make great gifts. You can use also use the 5x7 size on your holiday table to hold silverware.